St Paul`s Roll of Honour commemorates present and past members of St Paul`s Parish who served in World War One. The honour roll was a gift from an anonymous parishioner. UNVEILING CEREMONY. 232 SOLDIERS, 20 KILLED. 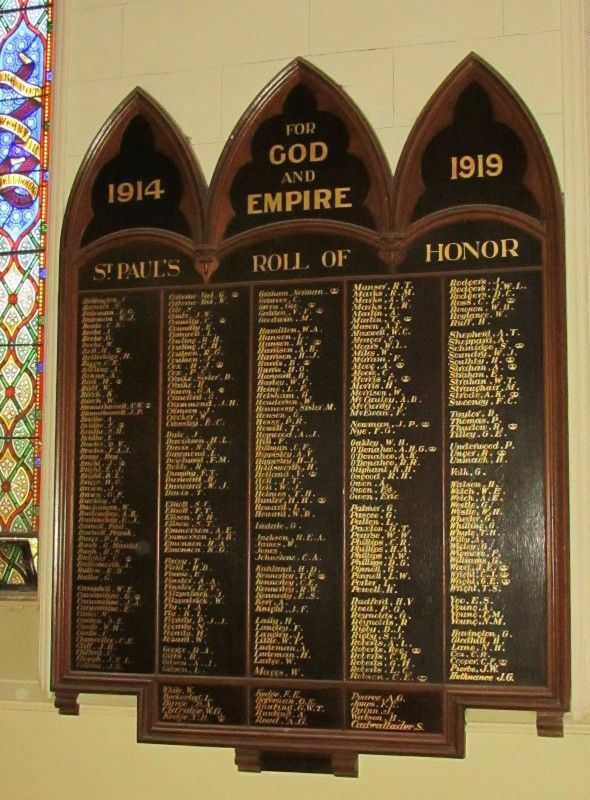 An honor roll to bear the names of all the present and past members of St. Pauls parish who have enlisted for active service, was unveiled by the Rev. G. H. Cranswick at yesterday morning's service at St. Pauls, the building being crowded with an intensely interested congregation. The board, which was given by a lady for many years a parishioner and worker, and who remains anonymous at her own request, was erected on the southerly wall of the nave, extending the whole width between two of the side windows. It was of oak, surmounted by three Gothic arches, to match the window architecture, with the arches and outer portions of the board in natural wood, and the interior divided into five panels stained a dark color, to form a contrasting background to the gold lettering of the names. A brass plate at the bottom was inscribed: "The gift of an old parishioner. October 21, 1917." Bendigo Advertiser (Vic. ), 22 October 1917.